We’d like to extend a special congratulations to Gerhard Kracher of Weingut Kracher for being named one of only five nominees for Wine Enthusiast ‘s 2011 Wine Star Awards. Weingut Kracher is one of the best known sweet wine producers in Austria, if not the world. Despite Gerhard’s relatively short time as Director and head winemaker of the company, he has continued to showcase the family’s legacy that his father, Alois Kracher, Jr., and grandfather, Alois Kracher, Sr., built and has truly made a name for himself in the international wine market. 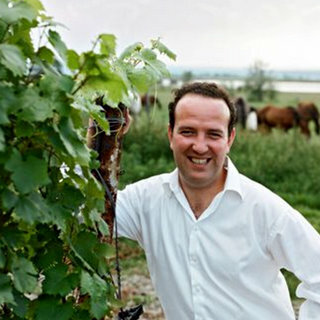 Just two years after taking the company’s reigns, Gerhard was named Sweet Winemaker of the Year in 2009 by the International Wine Challenge in London. Gerhard became Director and Chief Winemaker of the winery’s after his father’s untimely death in 2007, but his work with the winery dates back to the late 1990’s. Gerhard worked in the winery as a teenager and upon completion of business school in 2001, he took control of the company’s overseas markets and events; Director of the company was a natural progression. Like the generations before him, Gerhard pays special attention to the unique microclimate of the region, monitoring the grapes to ensure they reach their optimum ripeness levels. This Pannonian climate normally offers very hot summers, very cold winters, rainy springs and sunny falls. However, the winery borders Lake Neusiedlersee, a very wide and windy, though shallow, body of water that greatly impacts its surroundings. Also a result, this area offers more moisture in the summer and foggy mist in the fall that encourages the growth of Botrytis (Noble Rot.) Botrytis is what attributes to the luscious character found in Kracher’s sweet wines with exception of the winery’s Eiswein. After harvest, the wines are fermented and then blended via a series of blind tastings by Gerhard. He tastes each batch and will continue to blend various combinations until he finds the flavor, complexity and sense of places he is looking for in the blend. Each vintage may produce anywhere from 7-12 wines labeled by a number which denotes its sugar content in relation to the others. In special years, one or more of the wines will be produced from single grape varieties. Despite so much time spent in the vineyards, Gerhard has connected with many people throughout the world who will happily tell you a story about their meeting(s). It is no wonder that Gerhard Kracher has been nominated for this award. His character, winemaking abilities and overall dedication have made him a worth recipient of this award and we wish him the best of luck. Winners will be announced December 15, 2011. Stay tuned!